U.S. Rep. Will Hurd is at odds with Donald Trump. Will that save him in 2018? Hurd narrowly won a second term in what turned out to be the most expensive House race in Texas history. Democrats have put Hurd’s seat in their top five targets in 2018. TORNILLO — Midterm elections are known to be brutal on the party in power, and if there is an anti-Republican wave in 2018, look for it to touch shore right here. The vast, volatile 23rd Congressional District of Texas is bigger in area than 29 states. It stretches from San Antonio to El Paso and includes about one-third of the entire U.S.-Mexico border. Its overwhelmingly Latino electorate last year went for Democrat Hillary Clinton in the presidential race. But it also reelected a Republican to the U.S. House — one of fewer than two dozen in the country to split that way. Rep. Will Hurd narrowly won a second term in what turned out to be the most expensive House race in Texas history. Democrats have put Hurd’s seat in their top five targets in 2018. He will also be running to beat the fickle tendencies of a district that has ousted four different incumbents since 2006. Chief among the issues where Hurd is at odds with Donald Trump is on the president’s signature campaign promise — the construction of a border wall, which would cover 820 miles in the 23rd District, much of it on private property. Trump is stepping up pressure on Congress to include money for the wall in a must-pass funding bill needed to keep the government open beyond Friday. In interviews with several dozen of Hurd’s constituents, not one expressed the opinion that building a wall is the best way to control problems on the border. Hurd came to the job with an unusual background for a cowboy-country politician. He is a former CIA agent who was stationed in Afghanistan and Pakistan (“I was the dude in back alleys at 4 o’clock in the morning”) and an African American representing a district where only 3 percent of the population is black. His survival strategy is a model for an endangered Republican delicately navigating the cross-currents of the Trump era. Its success will hinge in large part on whether the election becomes a referendum on the president, or on the identity Hurd has carved out for himself. Democrats need to pick up 24 seats to take back the House, and Hurd’s is one of three districts in Texas they think may be in reach, thanks to anti-Trump energy in their base. They are putting organizers here earlier than they ever have before. A scorching, dusty morning last week found the 39-year-old congressman in the desert outside El Paso, at the dedication ceremony of a project he has championed for two years. A border crossing was being renamed in honor of World War I’s most decorated Texan, a Mexican immigrant named Marcelino Serna. The 5-foot-6 Serna volunteered for the Army to avoid deportation, and at one point he single-handedly captured 24 enemy soldiers and killed 26 in France. That his Mexican citizenship made him ineligible for the nation’s highest military accolade, the Medal of Honor, has long been a sore point with El Paso-area veterans. It was lost on no one there that Hurd was standing just a few hundred yards from where Trump’s wall would go. Currently, there is a fence, which local residents say has been effective in stemming illegal traffic. The congressman has been one of the most outspoken Republican critics of that proposal. Hurd says it would be an inefficient, impractical and wasteful “one-size-fits-all” means of controlling illegal immigration and reducing crime. In Hurd’s district and elsewhere throughout the state, support for enhancing border security runs strong. But there are also fears that a physical wall would violate the property rights that Texans hold dear, and be a kick in the gut to a regional economy heavily dependent on cross-border trade. Arreola, who was having lunch with Hurd in a resurgent old neighborhood near downtown San Antonio, said merchants are already sensing a drop-off in the flow of tourists and daytripping shoppers from Mexico — something the busi­ness­peo­ple attribute to Trump’s harsh rhetoric. Nor is immigration the only area where Hurd parts company with the Republican president. Where Trump dismisses reports of Russian hacking in last year’s election as a Democratic fantasy, Hurd — a member of the House Intelligence Committee investigating the matter — has said it “is going to go down in Russian history as the greatest covert action campaign.” The damage, Hurd added, comes not from any impact it might have had on the election outcome, but from the fact that it created a wedge between the president and the intelligence community, and rattled public trust. Hurd often traces his own decision to run for Congress to a briefing he gave nearly a decade ago, when he was an intelligence officer in Afghanistan, to a visiting delegation of Intelligence Committee members. One of them — Hurd refuses to say which lawmaker it was — asked him to explain the difference between a Shiite Muslim and a Sunni. “I thought it was the setup for an inappropriate joke,” he recalled. But when he realized someone sitting on the panel overseeing intelligence could be that ignorant of the great sectarian divide in the Muslim world, he figured he could do a better job himself. By conference call from Kabul, Hurd organized a network of friends from his days as Texas A&M University student body president to start putting together a congressional campaign in the district, which is near the part of San Antonio where he grew up. “It was home town, and a district where a dark-horse candidate could win,” Hurd said. He lost the 2010 GOP primary in a runoff, but tried again and won in 2014. Hurd stays close to the ground and in constant motion across his district. Across the miles, it can also feel as though he is spanning centuries. Last Wednesday found him at launch ceremonies for Environmental Protection Agency-funded wastewater treatment facilities that will free 78 remote West Texas households from their reliance on unhygienic cesspools and failing septic tanks. “When I was making the decision in Afghanistan to run for Congress, I didn’t know I’d be out here talking about sewage services, but this is the stuff people need,” Hurd said. The next morning began more than 500 miles and a time zone away, in a classroom at San Antonio’s high-tech Open Cloud Academy, where 15 students, mostly veterans, were training to work in cybersecurity. Hurd touted his efforts to expand GI Bill benefits to cover nontraditional courses in information technology. “Despite what you hear about Washington, D.C., there are some things people work together on,” he said. Hurd often boasts of the alliances and friendships he has forged across the partisan divide. When a snowstorm closed D.C. airports last month, he and a Democratic colleague, El Paso’s Beto O’Rourke, decided to drive back together, lighting up social media by live-streaming their 1,600-mile road trip for 29 hours. Democrats, however, say all of this is window-dressing. “When it comes down to voting, and the pattern of what he actually does, he falls right in line with the rest of the Republican Party,” said Manny Garcia, deputy executive director of the Texas Democratic Party. Garcia noted, for instance, that Hurd voted to roll back President Barack Obama’s executive order that delayed deportation of undocumented immigrants brought to this country as children. Hurd also refused to say whether he would have voted for the failed proposal that House Speaker Paul D. Ryan, R-Wisconsin, and Trump put forward to revise the Affordable Care Act. Democrats have two paid field organizers in the district, and are doing their best to tie Hurd to Trump. A week ago, more than 100 activists rallied outside the congressman’s San Antonio office to call for the president to release his tax returns. They have also complained that he lately has not been holding town halls, where his critics can vent their grievances about what Republicans are doing in Washington. Among the Democrats considering running next year is former Rep. Pete Gallego, whom Hurd defeated in 2014 and again two years later. One factor in his decision, Gallego said, is the possibility that a court-ordered redrawing of the district map could make it more favorable to a Democrat by removing some affluent parts of San Antonio. The political climate may also be shifting. Gallego said he recently attended an anti-Trump event in his tiny home town of Alpine, and was startled to see more than 150 people show up on a Saturday morning. Usually, he said, 20 is considered a good crowd in a town that size. Then again, there will also be forces working in Hurd’s favor. Texas Republicans generally turn out in heavier numbers than Democrats in off-year elections, and in 2018, popular Republican Gov. Greg Abbott will be at the top of the ticket. As Hurd is well aware, however, big political waves have a way of washing out even the best defenses. So he is determined to move faster than it does. Two days after their cross-country road trip drew national attention, U.S. Reps. Will Hurd and Beto O'Rourke signed on to legislation one another is working on. 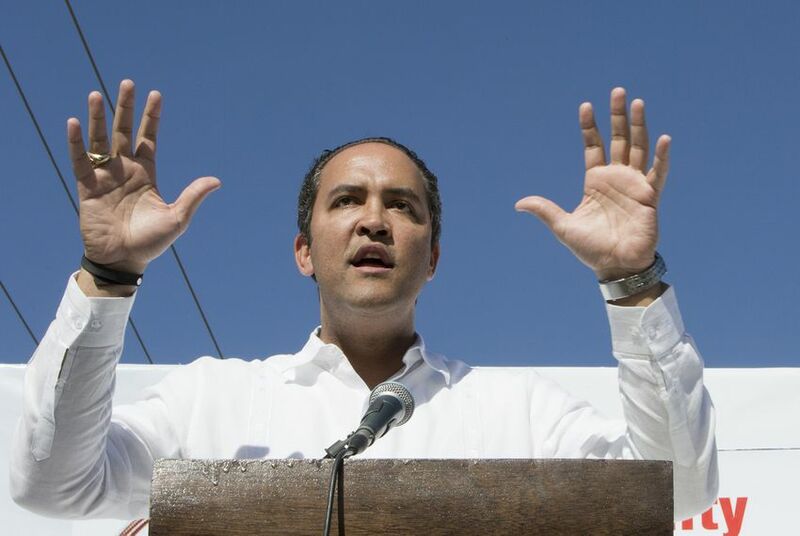 During a "bipartisan, bilingual, binational" rally, U.S. Reps. Will Hurd and Joaquin Castro spoke out against President Donald Trump's proposed border wall. Disclosure: Texas A&M University and Rice University have been financial supporters of The Texas Tribune. A complete list of Tribune donors and sponsors is available here.